Eddie, head of maintenance at Ruby Pier, a bit of a coward, a bit of a hero, is drawn to the heaven of five others who teach him his place in the universe. His life and death are not quite as unremarkable as he surmised. Eddie, who fixed rides at an aging amusement park, sees his life as wasted opportunity. Eddie, who loved and lost, and grew bitter with age, has to learn about life from the eyes of others. Part melodrama and part parable, Mitch Albom's The Five People You Meet in Heaven weaves together three stories, all told about the same man: 83-year-old Eddie. As the novel opens, readers are told that Eddie, unsuspecting, is only minutes away from death as he goes about his typical business at the park. Albom then traces Eddie's world through his tragic final moments, his funeral, and the ensuing days as friends clean out his apartment and adjust to life without him. In alternating sections, Albom flashes back to Eddie's birthdays, telling his life story as a kind of progress report over candles and cake each year. And in the third and last thread of the novel, Albom follows Eddie into heaven where the maintenance man sequentially encounters five pivotal figures from his life (a la A Christmas Carol). One by one, from childhood to soldier to old age, Eddie's five people revisit their connections to him on earth, illuminating the mysteries of his "meaningless" life, and revealing the haunting secret behind the eternal question: "Why was I here?" Each person has been waiting for him in heaven, and, as Albom reveals, each life (and death) was woven into Eddie's own in ways he never suspected. Each soul has a story to tell, a secret to reveal, and a lesson to share. Through them Eddie understands the meaning of his own life even as his arrival brings closure to theirs. "At the time of his death, Eddie was an old man with a barrel chest and a torso as squat as a soup can," writes Albom, author of the bestselling phenomenon Tuesdays with Morrie, in a brief first novel that is going to make a huge impact on many hearts and minds. Wearing a work shirt with a patch on the chest that reads "Eddie" over "Maintenance", limping around with a cane thanks to an old war injury, Eddie was the kind of guy everybody, including Eddie himself, tended to write off as one of life's minor characters, a gruff bit of background colour. He spent most of his life maintaining the rides at Ruby Pier, a seaside amusement park, greasing tracks and tightening bolts and listening for strange sounds, "keeping them safe". The children who visited the pier were drawn to Eddie "like cold hands to a fire". Yet Eddie believed that he lived a "nothing" life-gone nowhere he "wasn't shipped to with a rifle", doing work that "required no more brains than washing a dish". On his 83rd birthday, however, Eddie dies trying to save a little girl. He wakes up in heaven, where a succession of five people are waiting to show him the true meaning and value of his life. One by one, these mostly unexpected characters remind him that we all live in a vast web of interconnection with other lives; that all our stories overlap; that acts of sacrifice seemingly small or fruitless do affect others; and that loyalty and love matter to a degree we can never fathom. Simply told, sentimental and profoundly true, this is a contemporary American fable that will be cherished by a vast readership. Bringing into the spotlight the anonymous Eddies of the world, the men and women who get lost in our cultural obsession with fame and fortune, this slim tale, like Charles Dickens's A Christmas Carol, reminds us of what really matters here on earth, of what our lives are given to us for. In Eddie's life, we can see Anyman and in Anyman's we can see ourselves. Each person we meet in our lives, each course of action we are involved with, each path we embark on in our journey of life happens for a reason. We are destined to do certain things, meet certain people, and experience certain challenges, from the day we are born. This book is a classical example of this notion at its best. Albom takes a big risk with the novel; such a story can easily veer into the saccharine and preachy, and this one does in moments. But, for the most part, Albom's telling remains poignant and is occasionally profound. 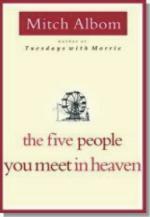 Even with its flaws, The Five People You Meet in Heaven is a small, pure, and simple book that will find good company on a shelf next to It's A Wonderful Life.